Have you considered spinning memories into stories, essays, or memoirs? Have you captured a trip in journal entries & been disappointed by the results? Have you traveled as tourist, pilgrim, adventurer, learner, intentional sojourner? Have you yearned for adventures, but not known how to make them happen? This workshop will illustrate how you let travel be our teacher! Share adventures or misadventures with others in a fun atmosphere. Reflect on how to travel more purposefully, independently, and intentionally. Practice journal exercises to develop insight & clarity. Consider types of travel to match writing supplies to take with you. Develop writing skills through observation, writing with six senses; and mixing fiction with fact. Select journal writing methods for your travel circumstances and/or your writing style. Stimulate imagination with tips, ideas, and suggestions shared. Make new friends and get to know old ones in new ways. Thank you, Rhonda. I’m a fan!! You may host a “house party” workshop – ask me about it! To register or to ask further questions, please send me an email at rhonda@rhondawiley-jones.com. 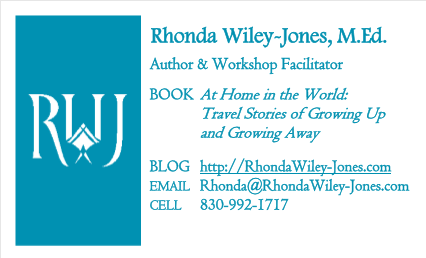 Rhonda Wiley-Jones, M.Ed., author of a coming-of-age travel memoir, At Home in the World: Travel Stories of Growing Up and Growing Away, is a world traveler, journal writer, blogger, and fiction writer. She has conducted this workshop with audiences, such as 2015, 2016, and 2017 Schreiner University’s Global Programs; the 2016 annual Story Circle Network national conference; the 2013 and 2014 Iowa State University Alumni Association Osher Learning Institute; and the 2013 Schreiner University’s Innovative Learning Program for community members.